Police Constable Bertchel Ramirez was murdered in Roaring Creek Village on Thursday, April 4, 2013. Later that same day, police arrested Juvencio Herrera, 34; Gregory Martinez, 26; Elilo Herrera, 41, and Steven Garbutt, 28, all residents of Roaring Creek Village, and charged them with murder. 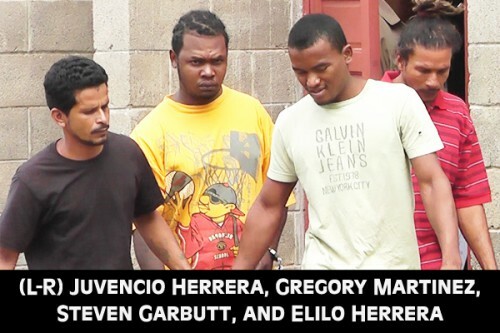 The four men were taken to the Belmopan Magistrate’s Court on Friday, April 5, where they appeared before Senior Magistrate Lindsbert Willis. They have been remanded to the Hattieville Prison and will reappear in court on July 19, 2013. PC Ramirez was reported to have been visiting his girlfriend in the Another World area of Roaring Creek Village. He left the house to respond to a shooting he had heard nearby when he was attacked by the four men who opened fire at him inside his vehicle. Ramirez was shot once in his shoulder and once in the head.